For many families, summer is the perfect time to escape and take a long holiday away! For the Kyttanen family a holiday away was not on the table due to our crazy hectic start-up life and limited cash funds. But if you are like me, staying in one place for too long, going through the day-to-day motions, can create a feeling of restlessness and a strong urge to get out of town. Which is why a staycation is the perfect alternative to have a vacation-like experience but without drifting too far from home. So if you are looking for an excuse to plan your family staycation, here are 5 reasons that should inspire you to book that weekend getaway right now! For 12 years NYC was my playground. A place that many people dream to go at least once in their lifetime. A city with so many adventures and activities right at your finger tips. Yet when I look back on my time there, I realize that I got too busy with "life" and regrettable didn't take advantage of all the unique things the city offered as much as I should have. And the truth is - you often hear people say this about where they live! Which is why I am an advocate of being a tourist in your own hometown! Depending on where you live, I am sure there is so much to explore or learn that you didn't even realize. Lucky for us, we live in the very large tourist state of California, with so many wonderful places to travel and explore which are only a few hours away from where we reside in West Hollywood. 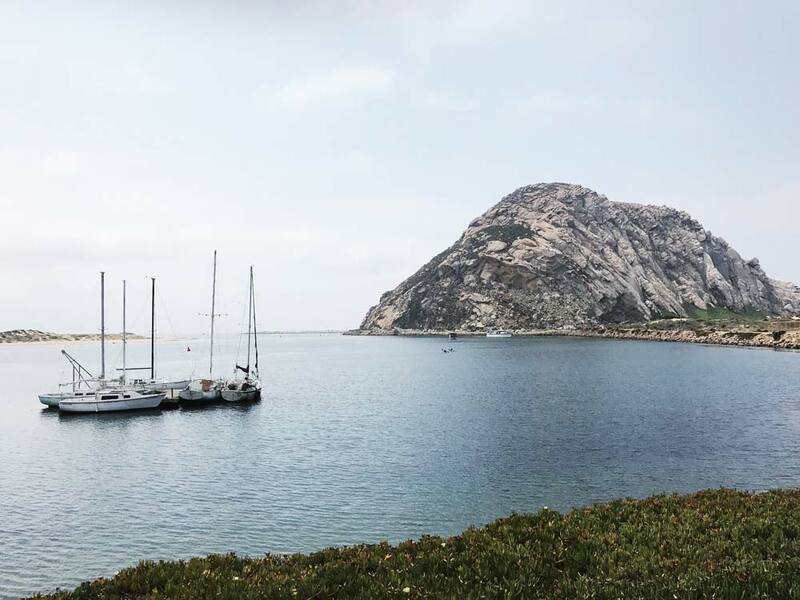 For this staycation, we decided to go up North to a beautiful, cozy and family friendly beach town - Morro Bay! This 22-23 million year old rock isn't alone on the coast--it is one of Nine Sisters of rocks that extend from Morro Bay to San Luis Obispo hills. The rocks probably came about from volcanic activity. Driving distance - with a toddler who doesn't like to sit still or be in the car for too long we only considered locations which were 4 hours max from home. Morro Bay was about 3.5 hours and it turned out to be the right amount of time for us. Toddler friendly - lots of places claim to be kid friendly but when you research the activities there is an age limit. Morro Bay had lots of choices like fun parks, good kid beaches, an aquarium, and more. Also you can take a short 20 min drive to visit Avila Valley Barn where your kids can feed the animals. Reasonable prices - the entire staycation to Morro Bay was budget friendly for us. However, everyone's budget is different so if you are looking to get away but be sure to create a plan that fits with your financial goals. A favorite local and tourist spot to stop at and buy the freshest fruit and vegetables grown locally, pick up a pie or bakery treat, stop off for lunch from our deli, get an ice cream and even feed the animals on the way to Avila Beach. Let's face it, traveling with children is tough enough. When you add a time change to the mix it creates a whole other level of challenges. Staycations remove these barriers making it easier on the whole family to adjust rather quickly. Saying that - I won't discount the fact that travel, no matter where the destination is, can throw everyone off their routines. For children this can be especially tricky. Which is why I suggest that you try to stick to your normal schedule as much as possible, especially as it pertains to eating and napping! A hungry sleepy toddler is something that I want to avoid at all costs! Immediately after a protesting tantrum in the middle of the sidewalk, Aiden found this local hot spot to run around in. Pack a cooler full of snacks and drinks - not only does this help for any sudden cravings (and to avoid any melt downs as a result) but it also saves money. Schedule your trip to include playtime stops before and after nap time - find playgrounds or places along the way where everyone can get out and stretch their legs. We stopped in Ventura's beach park on the way up to Morro Bay and Santa Barbara Shipwrecks playground on our way down. This helped break up the car ride but also provided some level of continuity to Aiden's daycare routine. Bring along their faves - toys, stuffed animals, movies, etc. Whatever your little one loves the most make sure you have it with you at all times! Communication - sometimes we forget that our toddlers understand way more than we give them credit for. If you talk to them about what to expect and where you are going it can really make a difference. All the newness and uncertainty can be overwhelming so being there for them both physically and emotionally really helps. Other tips from mommy blog "Life with Littles"
The local playground, Tidelands Park in Morro Bay, is full of fun nautical activities like this boat which was made to look like a ship wreck. We had fun creating our own version of the famous scene from the Titanic. If you are headed somewhere only a few hours away, it can be something you do rather quick and not super planned. Which ultimately means less stress! This is such a great option for our family since we are extremely busy entrepreneurs and parents who have little time to plan dinner in the evenings let alone an entire weekend away. The only thing we have to think about in these situations is to leave enough food and water for our cat while we are away. That being said, with children there is some planning that is required which is hard to avoid. For example, finding lodging accommodations which are kid friendly. Booking.com is a great way to research your options and get a very good price. We chose Inn at Morro Bay. A beautiful location with a pool and very kid friendly staff. It only took a little bit of homework to find options and then make a decision. Aiden enjoyed running around and trying to climb in the beautiful fountain in front of the main lobby of our hotel - Inn at Morro Bay. Ever since our family has been involved in a start up, I became acutely aware of how difficult it is to survive as a small local business in today's world. Which is why this is very important to me. Plus when you stay local, you support your own economy. In order to do this, I make sure that I find the local places - from restaurants (as opposed to chains or large conglomerates), to shopping (boutiques rather than well known retailers). Usually I find these smaller businesses offer a more individualized experience which results in better customer service. And this means I feel better about where my money is going! Babylonian Soap Company - Artisan crafted in small batches with deeply nourishing plant oils, butters, & extracts, carefully sourced from the highest quality sources, from gorgeous scented hand-made bath bombs to an exquisite facial care line, this woman owned business was a great find! Dockside - a great seafood restaurant - locally caught - fresh and delicious. Try the clam chowder! Suite 1 Morro Bay - a great place to find local artwork. I quickly became friends with gallery co-owner Bill Shewchuk, an internationally acclaimed photographer who captivated me with his stories of living in the South Pole to capture the amazing footage of Polar Bears and their cubs. The king of the sea and his Octopus. Imagination can run wild at Tidelands Park in Morro Bay. Getting time off and unplugging from your daily routine is proven to lead to more life satisfaction and less depression. Why is it then that on average Americans take less than 16 days of vacation per year? This doesn't even cover the amount of paid holiday entitlement in the E.U. which is set at a minimum of four weeks (20 days) per year! If taking time off and getting more time with the people that we love leads to a greater level of happiness - why not do more of it starting right now?! Morro Rock Jetty Beach is the perfect place for little ones to splash in the water just inside the jetty of the bay. Travel touches my soul, sparks creativity and satisfies my yearning for newness. I love to learn and experience new cultures and meet new people. By getting out of my comfort zone and taking time out from all the heavy adult responsibilities, I can show up in the world as my best self. I am so grateful for our special weekend away as a family and hope that by sharing this post you are inspired to take your own family staycation! If you do - please tell me about it! Snuggling my little guy over lunch in San Luis Obispo at a charming restaurant called Novo. Our table was overlooking a sweet creek.